What Happens When God Turns Up? Challenging the inherited assumptions that have been held tight for centuries, God is Stranger pulls the rug on what you thought you knew of God. Do you dare to change how you see God, and how life can't stay the same afterwards? Shortlisted for the Michael Ramsey prize 2019. So you think you know God? Taking a fresh look at Bible passages he thought he knew inside out, Krish Kandiah was struck by the uncomfortable recognition that when God turns up he seems to be much more likely to startle or frighten us, even start a fight on a dark night, than to sit down for a cosy chat. This God seems like a stranger. The one certainty seems to be that he is not like us. Wrestling with these Bible stories, Krish uncovers the truth of a God whose very unpredictability, his challenging strangeness, is the strongest indication of his real presence. We long for a tame God who will do just what we ask, and are disappointed when he doesn't turn up. The truth is, God could be right in front of us and we don't see him, because he's not who we think he is. The greatest challenge of our faith is to accept and come to know this stranger God as he truly is, for only then when will we equipped to see him at work in the world around us and love the stranger God has put next to us - the neighbour who might be from anywhere in the world, of any religion, the downtrodden or our oppressor: all are in need of God's love and it is us that God has chosen us to share his love with them. This is the strange truth of our faith - that it is only when we are ready to wrestle with God's strangeness to us that we will be able to see his kingdom advance among us. God is Stranger by Krish Kandiah was published by Hodder & Stoughton General Division in April 2017 and is our 13624th best seller. The ISBN for God is Stranger is 9781473648906. Be the first to review God is Stranger! 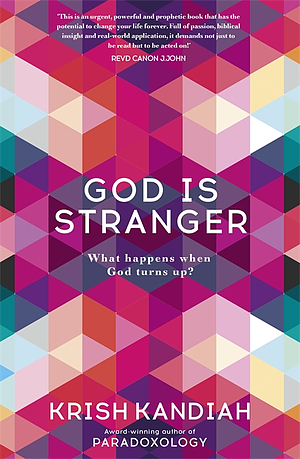 Take a peek at some articles related to God is Stranger. Got a question? No problem! Just click here to ask us about God is Stranger.